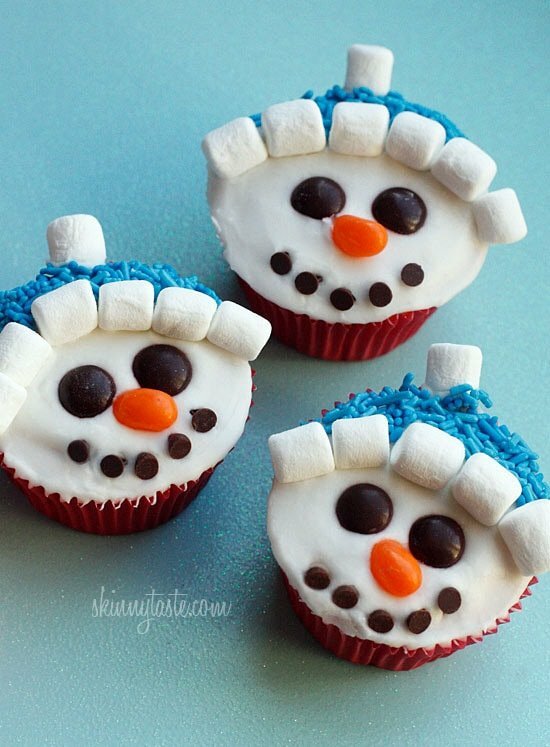 With Christmas just around the corner, these adorable holiday vanilla snowman cupcakes are low fat, easy to make and they are a hit with the kids! Some delightful holiday desserts to go along side these treats are Peppermint or Chocolate Meringue Cookies, Gingerbread Man Cookies (or even Christmas Trees), No Bake Chocolate Peanut Butter Cookies and Rudolph the Red Velvet Cupcake. To make the face, I used ingredients easily found in the supermarket. Jellybeans, mini chocolate chips, mini marshmallows and some colored sprinkles. The cupcake itself is made of Duncan Hines cake mix. I love experimenting with box cake mix, it makes whipping up dessert so much easier and I love how it can be used to make low fat treats! The most popular cupcake so far has been my Skinny Pumpkin Cupcakes made with nothing but cake mix, pumpkin and water. Second place is probably the Pineapple Bliss cupcakes that only required box cake mix and crushed pineapple, and then there is the Super Moist Chocolate Cupcakes made with only cake mix, pudding, pumpkin and water and let’s not forget the Pink Lemonade Cupcakes. Well here’s the latest combination I recently discovered, you can make deliciously easy, low-fat cupcakes with an 18.25 oz box of Duncan Hines Cake Mix, 6 oz fat free Chobani yogurt, egg whites and water. No oil or butter required and they come out delicious! For the vanilla icing, I simply mixed some powdered sugar with a little melted butter and some water and it was perfect for these cupcakes because the candy didn’t melt like it would if I used cream cheese frosting. 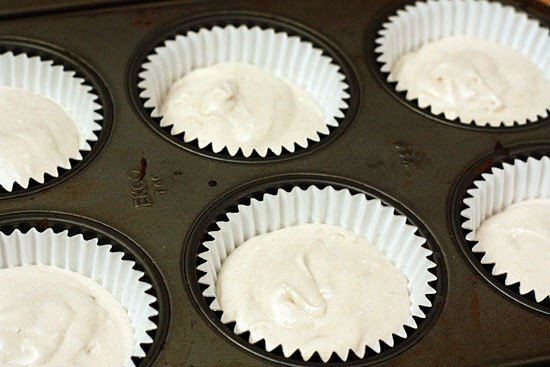 These cupcakes don’t use a lot of icing, less than a tablespoon on each. 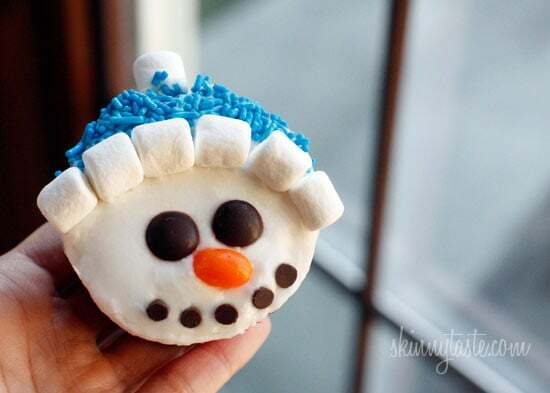 If you plan on making them into snowmen, work quickly putting the candy on or the frosting will harden. My daughter loved these! The nose and eyes were the first to go. Line cupcake tins with liners. Combine all the ingredients in a large mixing bowl and beat until combined. Bake about 25 minutes, or until a toothpick inserted comes out clean. Allow to cool before frosting. 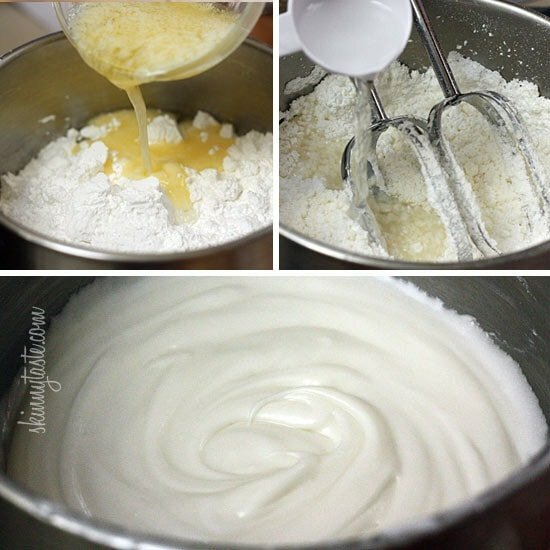 For the vanilla icing, combine powdered sugar, melted butter and water and beat until smooth. 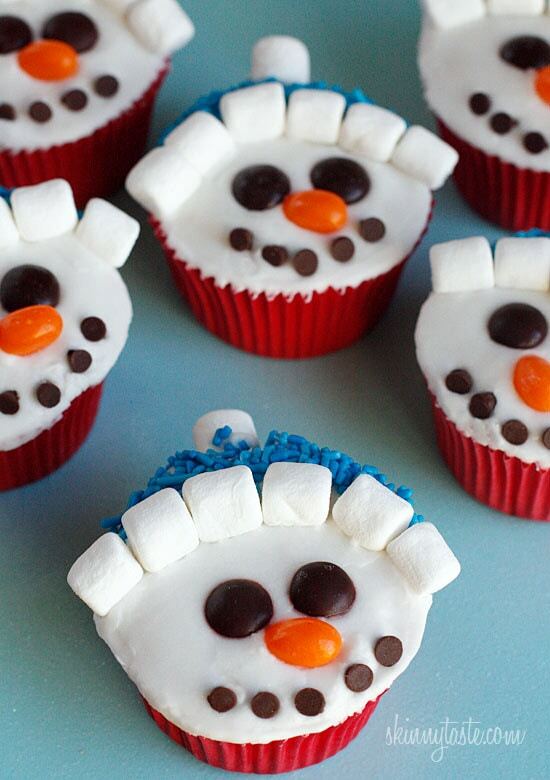 To make snowman face, spread 2 1/2 teaspoons of icing on each cupcake; working quickly, press the candy face into the icing before it hardens. It’s best to make one at a time. *Nutritional info does not include candy. This post was part of the Foodbuzz Tastemaker program with Duncan Hines. I am planning to make these for the kids at my son’s preschool. Can it stay without refrigeration from morning till evening at the school? I was wondering the same thing as Kaitlyn above. Can this recipe be made into 2 round cakes instead of cupcakes? Thanks! Love all your recipes, Gina! They've been a life changer for me! ohh I'm gonna make these tonight for the football game. Can't wait to taste them. I've never had yogurt in cake before. First of all another adorable idea! Second could you use smart balance butter? Thats all we use in my house…Also does the cake mix have to be Duncan Hines? Thanks for everything! i made these and they were so cute! Do you have to use Duncan Hines or can you use Pillsbury or your own homemade cake mix then just add those other ingredients? I made the cupakes and frosting and let me say those cupcakes tasted amazing!!!!! I am wondering what the calories, fat and sugar is without frosting??? Myself and Mother in law ate them w/o frosting to save calories. Sorry if I'm repeating a question, but I didn't read through all the comments. 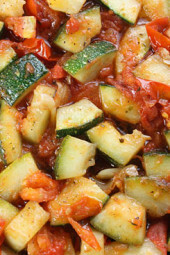 Would you be able to make this recipe (using the yogurt) in a 9×13 pan? Or 2 8inch round pans? Did you try it out as a cake instead of cupcakes? Did it work? I made these and the Super Moist Chocolate Cupcakes for my daughter's first birthday party. Even her grandmother, the daughter of a baker, was in love. So glad you all liked them!! I made them this past weekend… they were AMAZING! Loved it with the Greek yogurt!! My little is sitting next to me and he says the whole time that i have to bake these cute cupcakes! Oh my gosh these are just tooooo cute!! I want to try and be original and come up with a great holiday cupcake but seeing things like this makes me just want to copy you! LOVE THIS! I am sooo making these with my girls this weekend and we will have to share them with the neighbors! Love this Gina! 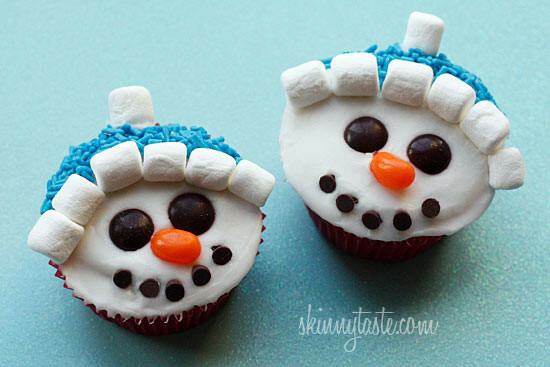 I am going to make these for my co-workers just to ring in the winter season. I haven't made a recipe on your site that I didn't like. Keep up the great work!!! Thanks for all the Holiday ideas to do with the kids they will love this one. I made these last night with Funfetti cake and just the frosting(didn't have the decorating stuff on hand) and they are DELICIOUS! Thanks so much for your awesome recipes! Yes, those are mini chocolate chips for the mouth. I don't think you need kids to make this, they are so stinking cute and seasonal, your friends, neighbors, ect would be impressed. You can just decorate a few if you wanted to. I don't think the points change with this small amount of candy. Yes, these can easily be made into santas! Any brand of fat free yogurt would work. Greek is creamier so I would use that. What would the point value be with the candy? You always give me the best things to make with the granddaughter. thanks! And what a cutie! these are so stinkin' fun! These are sooo adorable! I can't wait to make them! Can I use any brand of fat free yogurt? Thanks for the recipes. Plan on making these with my grandkids this weekend. This is my favorite site. Super Cute-the snowmen & your daughter! I'm thinking that red sprinkles could turn them into Santas!!! I can't wait to make them!!! These are adorable! I am getting so excited for the Holiday season! 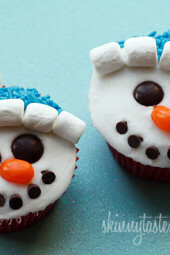 These are the cutest cupcakes! I am a third grade teacher and I think I will have to let my students have a cupcake decorating party. SO DARN CUTE! And not too tricky, which makes it a win-win. These are so freaking adorable! Gina, I love the new wintery layout! 🙂 Beautiful! Can I just tell you how absolutely beautiful your daughter is? Thank you for including the picture– my grand daughters are at a similar age and I will be sharing these with them. I also want to thank you for all the work you put into your recipes so we get all the wonderful benefits of fun, yummy food that fit weight watchers and a pretty healthy diet in general. I have told so many people about your site and often I will be eating something a friend has made and when I say how delicious it is they always say its your recipe. Thank you so much! Many blessings to you. OMG! How adorable! I love these little cupcakes. I wish I had kids so I can make some, maybe I will for work? To cute!!! So cute!! And I love your wintery blog header too!!! Those are so cute! I can't wait to make them. I think I might wait until January when people are trying to get healthy at the Mr's work and I can surprise them with being able to fit treats into their calories without sacrifice! That's what I love about this adventure and people like you helping me do it along the way! These are so cute! My kids are too old to take cupcakes to school so I'm racking my brain trying to think of an excuse to make them. They would be cute to give to neighbors! Are those mini choc chips that you used for the mouth? How beautiful! I am definitely going to have to try these out soon. I also LOVE the new banner! You are the next super mom, I swear. Thanksgiving just wrapped up and you have snowmen up and posted already! I can't keep up! I love the use of yogurt in the cupcakes, I'm sure it pumps up the protein, too! I love how these are simple enough to decorate at my classroom's holiday party! Adorable! Gina you are so Awesome! Thank you for all you do! 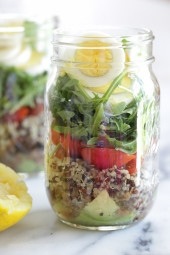 I cannot wait to make these!!! My daughter's 9th bday is Dec 1st and next Saturday I am taking her and two girlfriends to Snow Mountain (Stone Mountain, GA). Then, we'll spend the night in a hotel before heading home the next day. I HAVE to figure out how to make and take these safely. PERFECT!!! And so adorable!!! 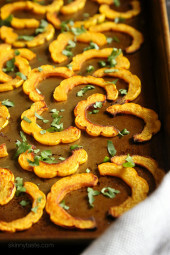 Can't wait to whip these up (and sneak one myself…shhhhhh!)!! Thanks about the festive banner! 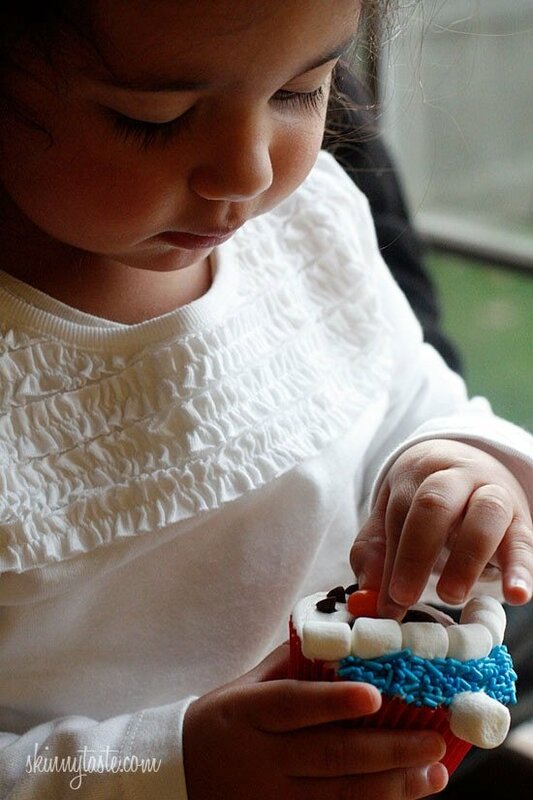 My daughter's second birthday is next weekend too! Oooooohhhhh…my son's 5th birthday is next weekend and he wants to have these instead of cake! How fun! Soooo cute!! Love the new festive banner, by the way. Thanks!